Upcoming Drama: Girl’s Day’s Minah, Yeo Jin-goo, and Hong Jong-hyun Are Caught in a Love Triangle! Did you know that Minah, one of the members of Girl’s Day, isn’t just an idol, but an actress, too? If you already know and have been following her work until now, then you may be happy to know she’s going to make her comeback as an actress! The last time she starred in a drama was in 2016, when she starred as Gong Shim in SBS romantic comedy series Dear Fair Lady Gong Shim, and received positive reviews about her portrayal of her character. Are you curious to find out what kind of drama she’ll be in next? Let’s take a look at it! Absolute Boyfriend is a romantic comedy based on the Japanese manga series with the same name. In this drama, she will be acting together with Yeo Jin-goo and Hong Jong-hyun as the main characters. The drama was originally given the working title Romantic Comedy King, but was later changed to the current title. Meanwhile, the lead roles for the drama was also previously offered to Song Ji-hyo and Chun Jung-myung, but both actors declined it and the lead roles were then given to Minah and Yeo Jin-goo. The drama, itself, tells a story of Um Da-da (Minah), a makeup artist who has never had much success with love, and resulted in her become insecure about it, and Zero Nine (Yeo Jin-goo), a humanoid robot programmed to become the ideal boyfriend. Hong Jong-hyun will act as Ma Wang-jun, a top actor who also has a crush on Um Da-da. The story deals with the love triangle between Um Da-da, Zero Nine, and Ma Wang-jun. The first script reading of Absolute Boyfriend was held on June 22, 2018, and filming began in July. It’s since been reported that the filming is complete and the drama will be broadcast in the first half of 2019 with 20 episodes. Even though there were a few other dramas involving humanoids before Absolute Boyfriend, there might be something different from the other dramas, and since the drama will be aired in the first half of 2019, it should be just a matter of time until it premieres. So, you have to wait for just a little while if you want to watch Absolute Boyfriend! Through social media, we can find out what’s Minah been up to recently. Let’s see a few posts that she has shared through her Instagram! In this post, she shared a selca she took in front of the mirror. By looking at the caption, we can assume that she was sleeping over at her grandfather’s house at the time. This time, she’s posed in front of a shop that looks quite vintage. Coincidentally, the color of the shop’s walls goes well with the colors of her clothes! She looks stunning in this photo, don’t you think? She also posted a photo on Seollal Day, and didn’t forget to ask her fans about their holiday. She shared that she went to see a musical for the first time in a long while. After wondering about her destination, we could find out that she was actually going to the ocean! Minah shared a photo where she’s posing on a bridge with the beautiful sea in the background. It looks like she’s having fun! If you want to see more of her updates, you can visit her Instagram account @bbang_93! Even though it’s been a few years, it seems the cast of Dear Fair Lady Gong Shim still maintains their friendship and keeps in touch with each other! What do you think about Girl’s Day’s Minah upcoming drama? Are you excited for it to start? 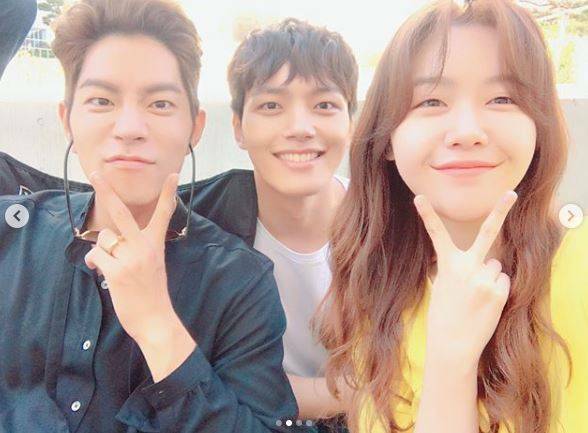 Don’t forget to share your thoughts about Minah’s upcoming drama, Absolute Boyfriend, with Yeo Jin-goo and Hong Jong-hyun in the comment section!